Who’s been to Medieval Times before? Show of hands! Yeah, it’s awesome, right? 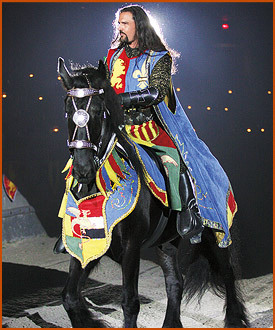 We have been going down to Chicago for years and hadn’t gone to the Medieval Times in Schaumburg, which was a shame. 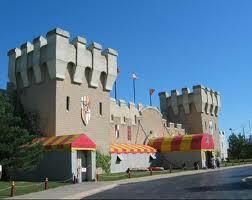 The Medieval Times castle in Schaumburg, Illinois. It's actually much bigger than it looks here. Anyway, that leaves among our merry band Shaylyn and Andrea who hadn’t been, and both really wanted to. So on this trip, we decided it really was about time we experience this as a group. Besides, everything is more fun with a 9-year-old. It turned out we didn’t need Shaylyn to invoke a childlike sense of roleplay and wonder at Medieval Times. We sat in the red knight’s section, which was fortunate, because he ended up being the total badass champion. We cheered him on with many shouts, screams, cheers and boos and hisses for his opponents. We even led a toast to our knight, and waved his flags and pennants around wildly. The key really was entering into the spirit of the thing, cheering for our knight and suspending disbelief for awhile to enjoy the storyline and the feats of equestrian showmanship on display. We had an awesome server, who said his name was Jelly. Sam took on the role of lord of the table quite readily, calling out for Jelly in a booming voice and hamming it up with medieval-inspired quips throughout the fighting. What fun! A Medieval Times photo of the "Lord Chancellor," or announcer. I didn't get any good photos during the show; they're all dark and hard to see. But I am pretty sure this is the same guy. As for the rest of us, we were hoarse from cheering on our knight at the end of the night, and pleasantly full with what was actually a decent meal for being served to hundreds of people at once. They’ve really got the particulars down at that place. Of course, you have to eat it all with your hands, but there are plenty of napkins. For the more macabre-inclined among us, they also have a medieval torture gallery off the main hall, but it cost extra, and we didn’t feel great about taking Shaylyn through it anyway, so we opted out. All in all, a worthwhile experience, and—I forgot to mention—we got a great buy one admission, get one free deal on the tickets, which is actually what put it on our radar for this trip in the first place. If you can get a price break on the tickets, it becomes a pretty good deal, but for medieval enthusiasts or if you have kids who are really into knights or medieval stuff, it’s probably worth the admission whenever you go. So, what was your Medieval Times experience like? Were you as delighted as we were? Which Medieval Times did you go to? If you haven’t been, are you interested?